"Was [reporter and scandal-investigator Hugh] Fullerton a Don Quixote? He took a huge risk, and lost. He underestimated baseball's ability to keep the lid screwed tightly on the scandal. Fullerton had a blind spot when it came to the Sox's owner...and this ultimately cost him. He imagined that the baseball owners and [American League President] Ban Johnson had consciences to which he could appeal with passion and logic. he may have hoped that his voice would be joined by writers in every major city, and his articles would be the snowball that started an avalanche. But instead, by iself, his case had more like a snowball's chance in hell." I usually like to include a short but meaningful quote from the books I review, some pithy comment by the author, to give you an idea what his or her book is about, but Gene Carney presented me with a unique problem. There is very little about his book that could be accurately described as "pithy". Not to be misunderstood, it's not as though he goes off on weird, irrelevant tangents all the time like, for example, I do. It's just that his subject requires fairly dense prose to give it the proper attention, which he does. The quote above does the best job of summarizing the meaning of and reason for the book he wrote. It just isn't short. Sorry about that. But I'm getting ahead of myself. Let me back up. 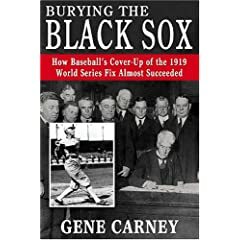 I first found out about this book in March, when I wrote a column for All-Baseball.com about the 1919 Chicago White Sox, ostensibly because last year's White Sox team wasn't ineresting enough to justify a column, but really just because the Black Sox were what I wanted to write about anyway. Mr. Carney's publisher commented on the post and contacted me to see if I'd be interested in reading and reviewing this book, which of course, I was, and I did. You see, I spent perhaps the better part of a week doing research for my article, while Carney spent years researchiing his book. It turns out that I had a lot to learn.